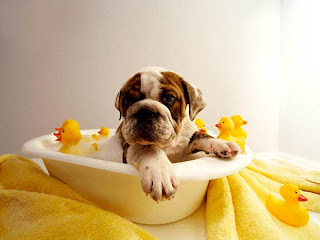 Dog Site: How often should I bathe my dog? Can I let him bathe in the sea? How often should I bathe my dog? Can I let him bathe in the sea? There is no hard and fast rule as to how often to bathe a dog. If your dog smells or is scratching, or is losing his coat excessively, you should bathe him. If his coat is clean and shiny and you groom him regularly, I think he shouldn't be bathed more than once every three months. Bathing softens the coat and takes away natural oil, although the friction from rubbing the dog dry and getting out the old coat more than make up for these things. Always use good dog soap, and the result should be a nice, sweet smelling, clean dog. Bathing in the sea is not good for dogs’ coats and often leads to eczema. Let him bathe if he wishes, but pop him into the bath afterwards, and rinse the salt out with warm water before drying him. Otherwise the salt leaves a deposit in the coat, eventually leads to scratching. Long-coated breeds suffer from this more than short-coated breed. If you want proof that sea water is bad for hair, see what a state your own hair is in after a few days of swimming in the briny.